We occasionally host private parties exclusively for CupidNights members at some of London's most stylish and fashionable venues. Register below for mailing list. For those who are graduate professionals, our friends at The Single Solution organise parties every week for specific age groups. 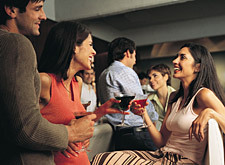 With the friendliest hosts in the business you can be sure of a great night out. The events are held at top London venues, and include ice breaking activities, and optional speed dating to ensure you get to meet the other party goers.